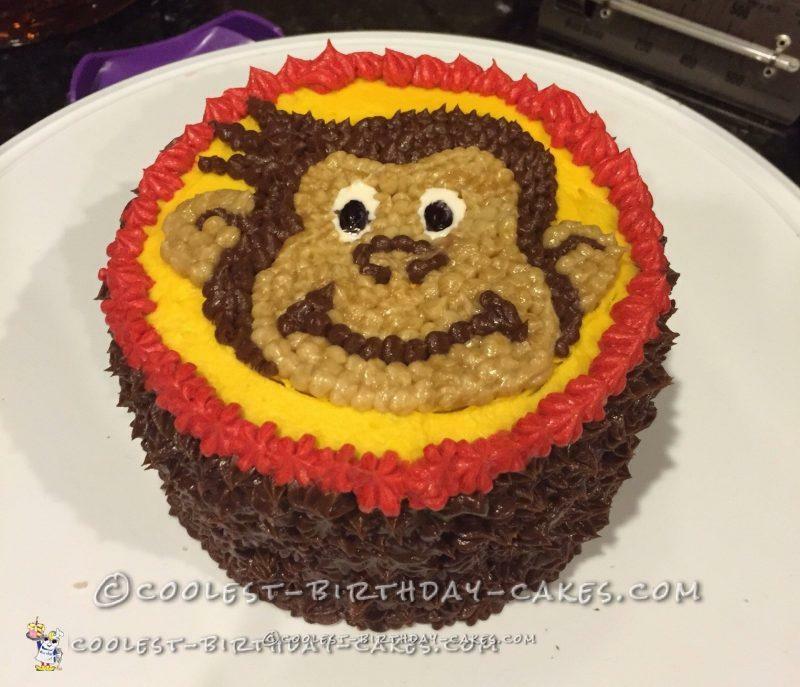 For my nephew’s 1st birthday, I made a Curious George cake and a matching smash cake. I wanted to bake something special that he would love. I know as a 1 year old he won’t remember, but he loves Curious George. I decided on a homemade white confetti cake. I found a very good recipe on food52.com. It even includes a recipe to make your own sprinkles (which I ran out of time to do). 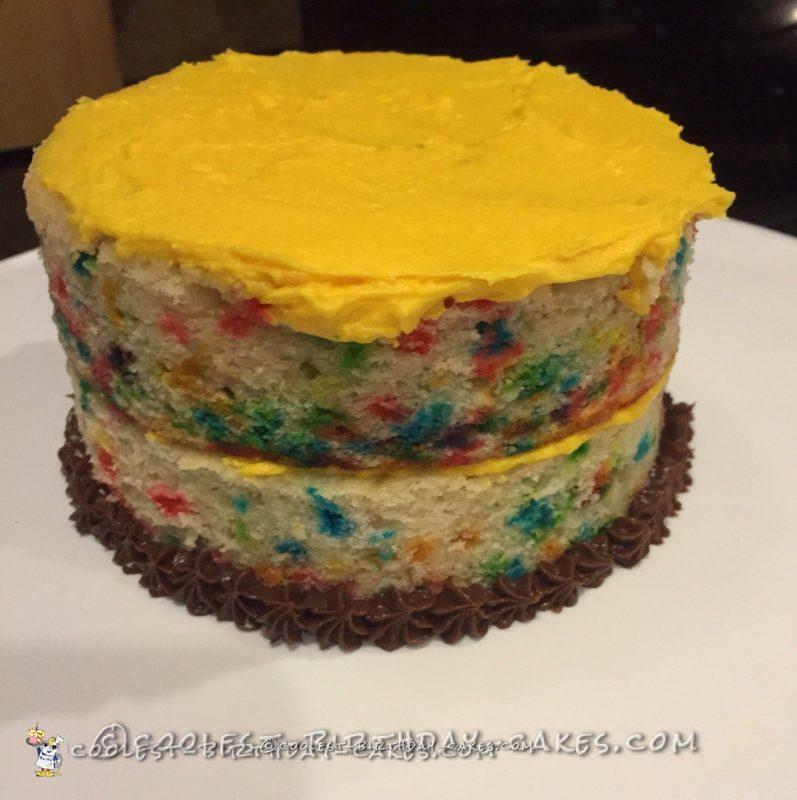 It is packed with beautiful sprinkles and has a very nostalgic vanilla flavor. 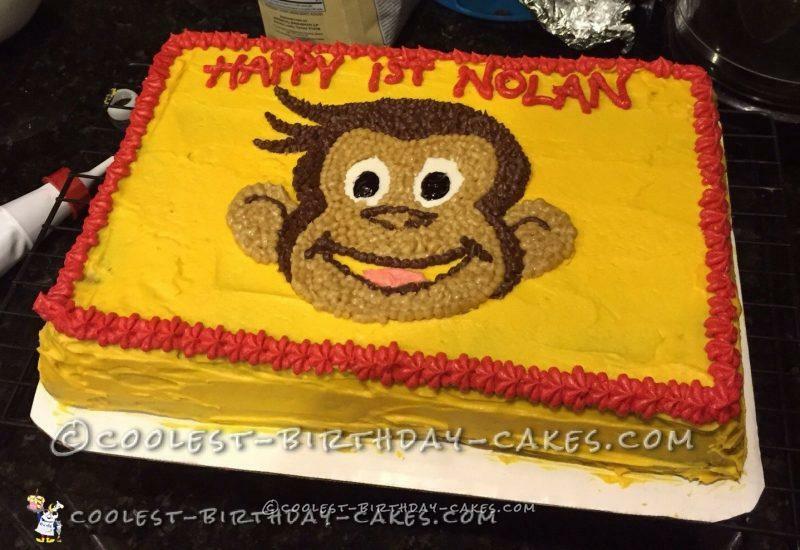 I used the same batter for both the 9×13 and the smash cake. 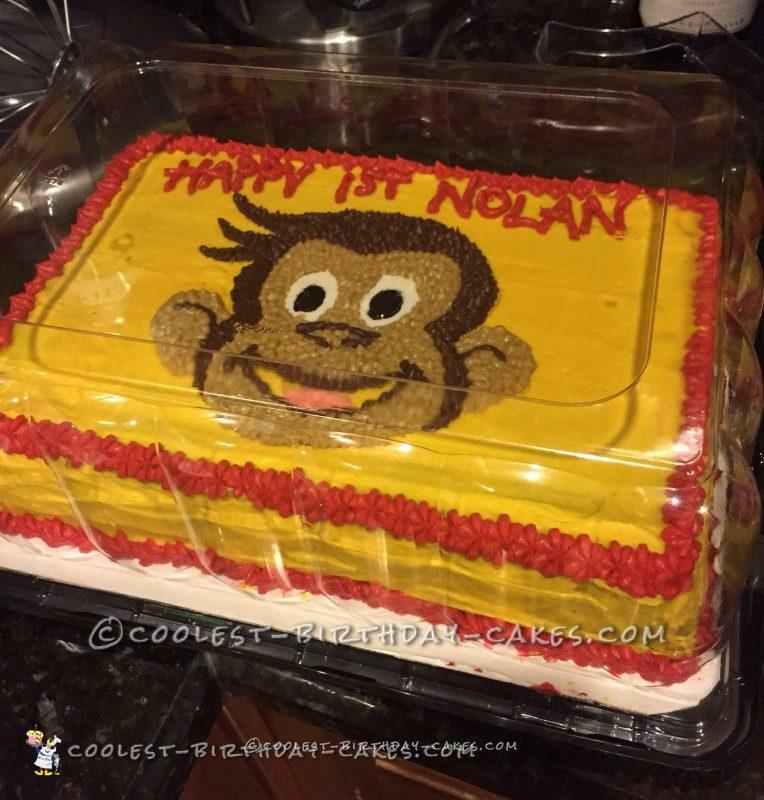 For the smash cake, I made two 8″ layers and used a 6″ circle cookie cutter to cut out the middle to make it slightly smaller for him. 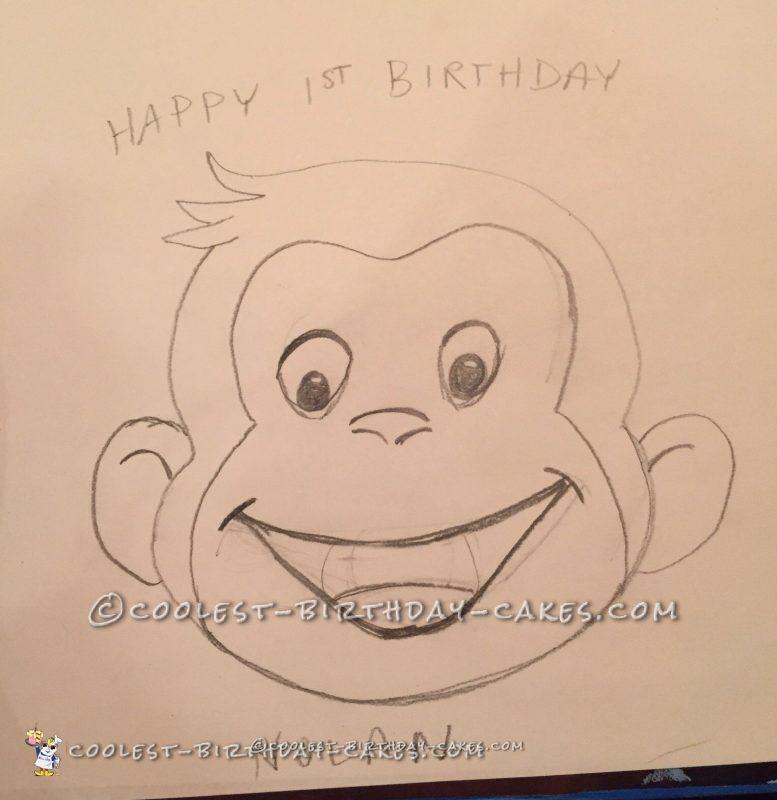 Next, I researched images of Curious George for a long time and finally settled on just his face. I made a basic buttercream for most of the frosting, including the base yellow layer, the tan color, and the red. To tint the tan frosting, I used a 6:1:1 yellow:red:blue ratio. I used a chocolate buttercream for the darker brown. I frosted the whole cake with the yellow first. After practicing the picture with pencil and paper a couple of times, I drew the outline in the yellow frosting with a toothpick. I had 3 different frosting bags and couplers, so I was able to fill it in pretty quickly. I wasn’t quite sure what texture I had envisioned, but started by filling in the outline with dots and decided that looked ok, so I just continued until it was all covered, like a frosting color by numbers. I just used the chocolate buttercream with the star tip to cover the sides of he smash cake. Finally, I used the red to add borders and voila! I cannot wait to see my nephew’s sweet face (or his parents’) light up tomorrow when he sees this!